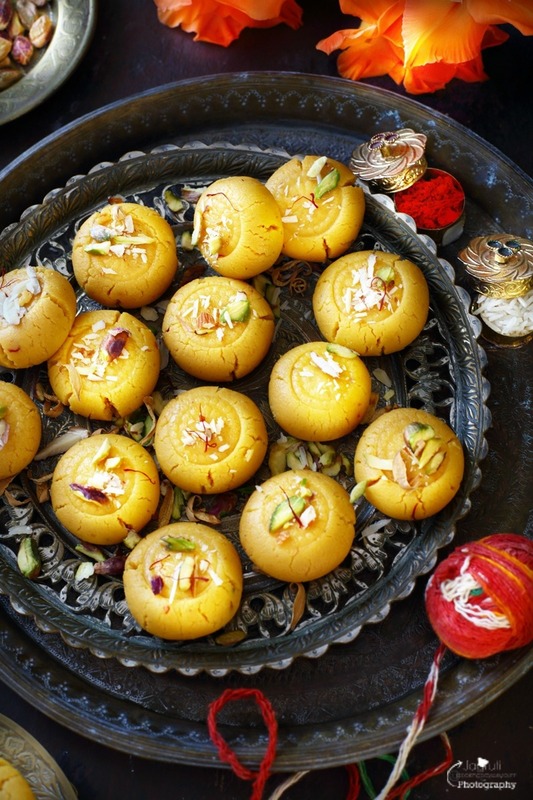 Kesar Mawa Peda ( Indian style Creamy Saffron Fudge ) with a magnificent taste, it's rich and melts in your mouth. 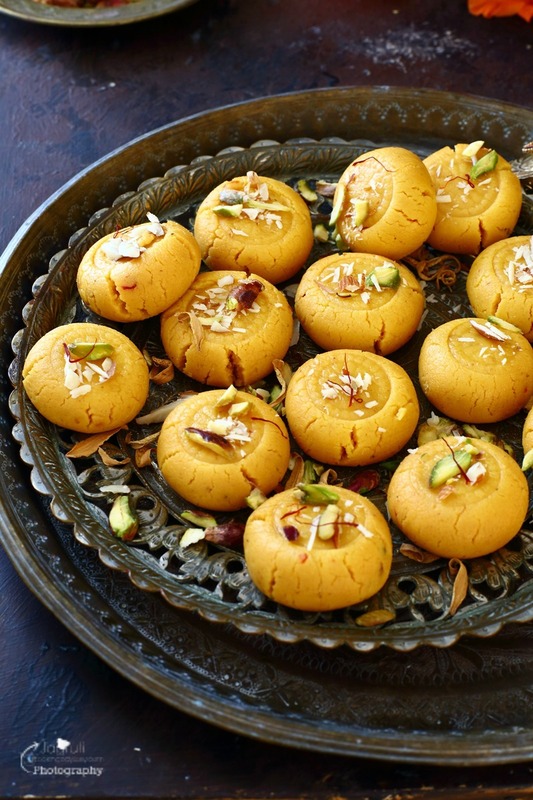 Sweet flavoured creamy Peda with saffron and aromatic spices , adorned with rich nuts are perfect to celebrate Shree Krishna Janamasthmi. Indian festive season is in full swing, and this festive ambience tempts me so I have unleashed myself for making some delectable delicacies at home for friends and family, because I personally feel that it is always good to add your personal touch by making mithai at home. Pedas are my all time favourite Indian Mithai, I adore them most. Offer me a plate of assorted mithai, and see first where my hand reaches out for ? 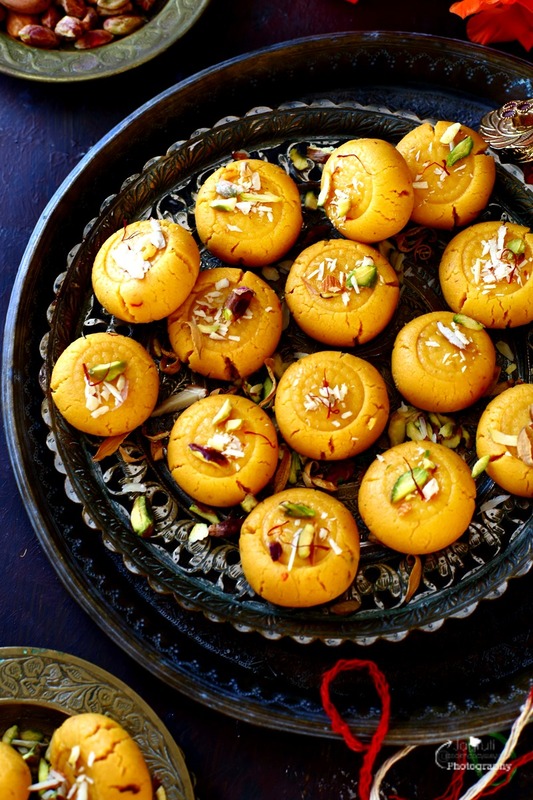 Rich, soft, milky and aromatic peda always makes me happy, I could never stop at one. I could trade any western fudge for these, they will bring same deliciousness and make my taste buds dance ! 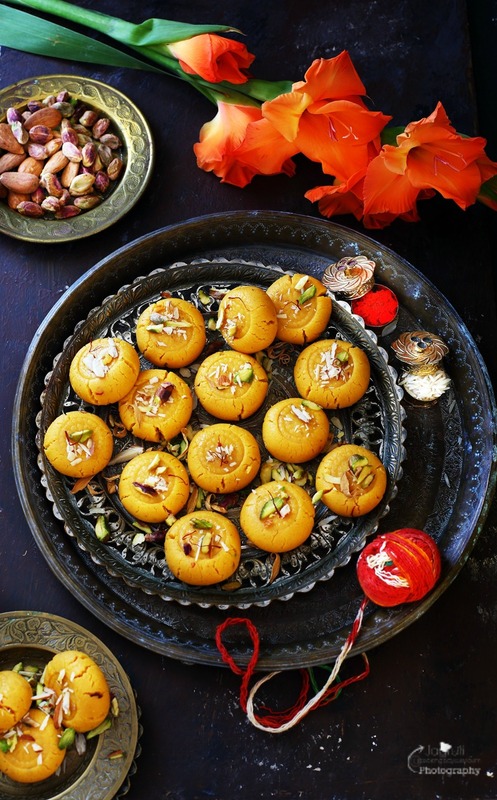 Mawa Peda, Mango peda, salted cramel Peda Ricotta Cheese Peda or Mathura Peda . 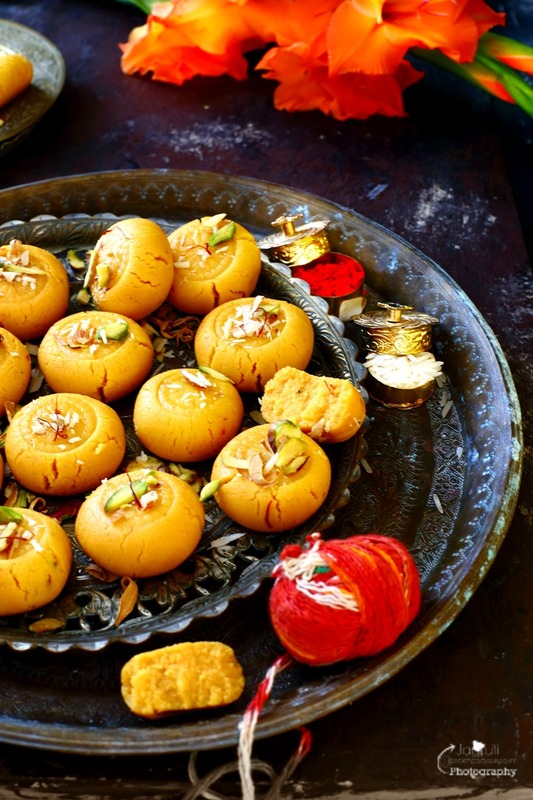 Kesar Mawa Peda, have a first bite and you will congratulate yourself for eating such a marvellous piece of heaven. I love how just few ingredients are in this and effortlessly it is thrown together..swooning over this !!! Use full fat milk powder and double cream if you can't get hold of khoya, but increase volume of the double cream. I have not used any kind of food colour in this recipe. Kesar Mawa Peda ( Indian style Creamy Saffron Fudge ) with a magnificent taste, rich and just melts in your mouth. Warm up the cream in M/W for 20 seconds. Meanwhile grind the saffron in mortar and pastle. Add in warm cream.Let it steep in the cream for about 30 minutes or more. I left it in the fridge whole night. Heat ghee in a heavy based kadai, add khoya and roast the mawa on a low heat for couple of minutes. Then add sugar and saffron infused cream, combine well and cook the mixture til sugar dissolves. Keep stirring the mixture until mixture leaves sides of the pan.Switch off the heat. Add cardamom and nutmeg powder and mix well.Let it cool a little. Rub some ghee on your palm and knead the mixture while it is slightly warm. Also you can give them some imprints or design. Garnish with slivered nuts and saffron threads. Serve as a prasad or devour on this festive season with friends and family. These little cookies sounds so flavorful! I can't wait to try them. Oh wow, this isn't like anything else I have seen before. But, I bet the flavours are amazing! These are beautiful! The flavors of saffron and cardamom must be so good in this. I'd love to try one day!